Looking for directions on how to put together your new piano bench? It's actually quite quick and simple, and can be done in a matter of minutes. Your piano bench will be shipped to you nearly completely assembled, with you only having to attach the legs to the frame. 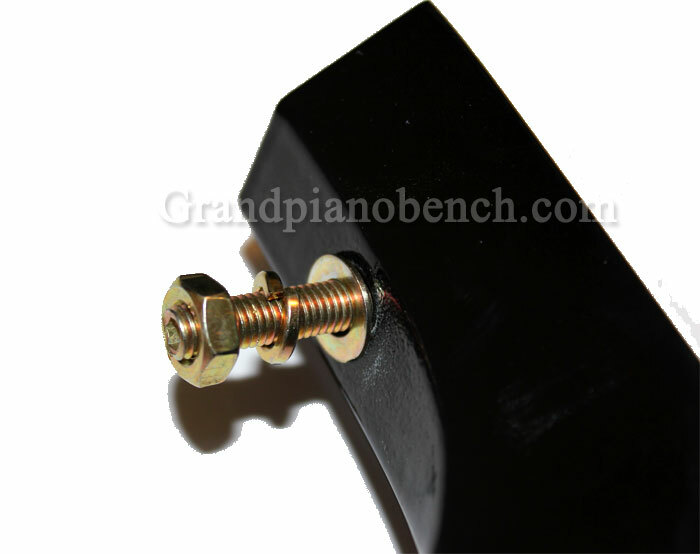 A typical piano bench will come with 3 pieces of hardware: a washer, a lock washer, and a nut (seen from left to right in the picture below). The lock washer is the washer with a cut in it, and it is not completely smooth or flat. This piece is important, as it prevents the nut from loosening as you play over time. The arrangement of the hardware goes in the order shown above: first the flat washer, the lock washer in the middle, and the nut on the end. Seen in the picture below. 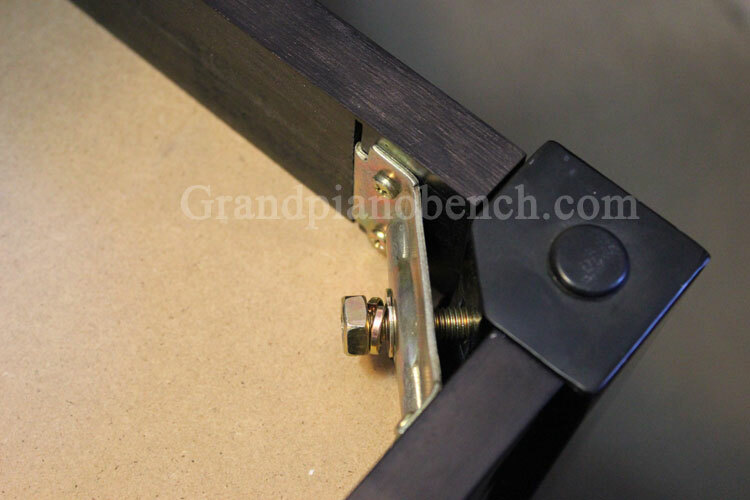 To attach the leg, you put the bolt in the leg through the side brackets in the piano bench. All 3 pieces of hardware will go on the inside of the music compartment. The flat washer will be against the brass bracket. When first assembling a piano bench, you should only hand tighten the nuts on each leg, until you have all four legs on. After all are attached, place the bench on a flat surface, to ensure the legs are on evenly and the bench is level. If they are not, you may have to loosen one of the nuts on the leg, to let the leg and frame level itself (gravity will do the work). After all legs are level, tigthen all the nuts with a wrench--making sure not to strip the nut by over-tigthening. It's always a good idea to check how tigth the nuts are every few months, and re-tighten if necessary.